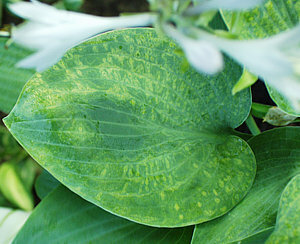 Once a plant is infected with a virus it has to be destroyed, as there are no cures or treatments. HVX is the most common by far and still frequently found in plants for sale at the lowest prices in box stores and garden centers. The HostaLibrary has great symptom pictures and everyone should familiarize themselves with what HVX looks like before shopping for hostas. It is unusual in that it can go years without symptoms. Other viruses have different looks, so any unusual looking mottling or markings should generally be avoided. If you see one plant in a batch at a nursery that shows symptoms, do not try to pick a healthy-looking one from that batch - any of the others may be infected too and just not showing symptoms yet. Any virused hostas in the ground must be dug up, getting as much of the roots as possible and trashed or burned. Tools and hands should be scrubbed to clean off any virus particles. Either use a rock or garden ornament in the spot where it was or a plant other than a hosta if it was HVX. Viruses other than HVX generally spread more easily. More info on HVX can be found HERE. In the Garden: Learn to identify virus symptoms and immediately remove and burn or trash any plants showing signs of a virus to prevent it from infecting nearby plants. In the Nursery: All plants in a batch where some show infection must be destroyed. Watch neighboring lots for signs of infection. Use test kits on anything suspicious and plants bought from sources known to be moving infected stock.